You are currently browsing articles tagged Paris Airport. 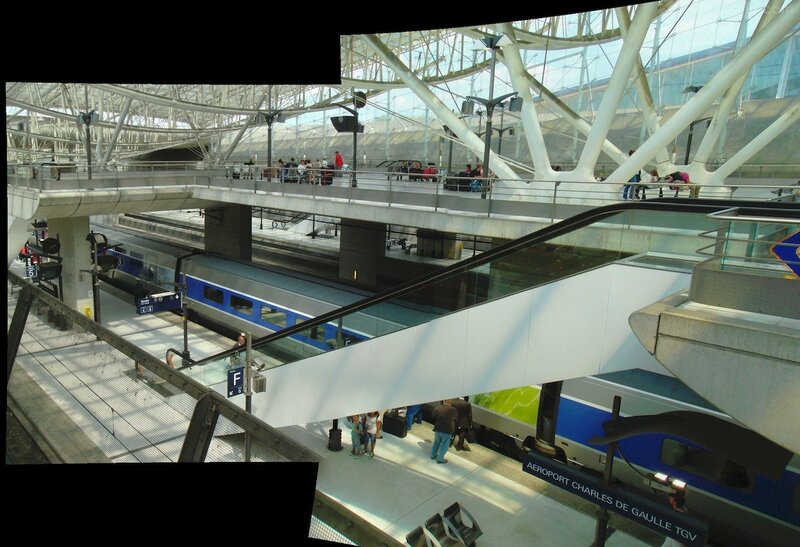 This is a step-by-step photo guide of taking RER B Paris city trains from CDG Airport Terminal 2 to Paris city centre. 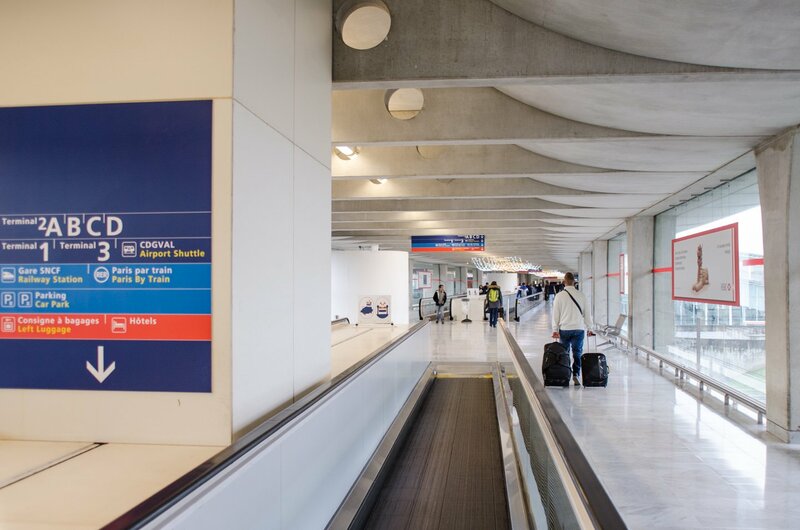 From the CDG arrivals lounge to central Paris, I’ll guide you step-by-step on how to make this transfer. 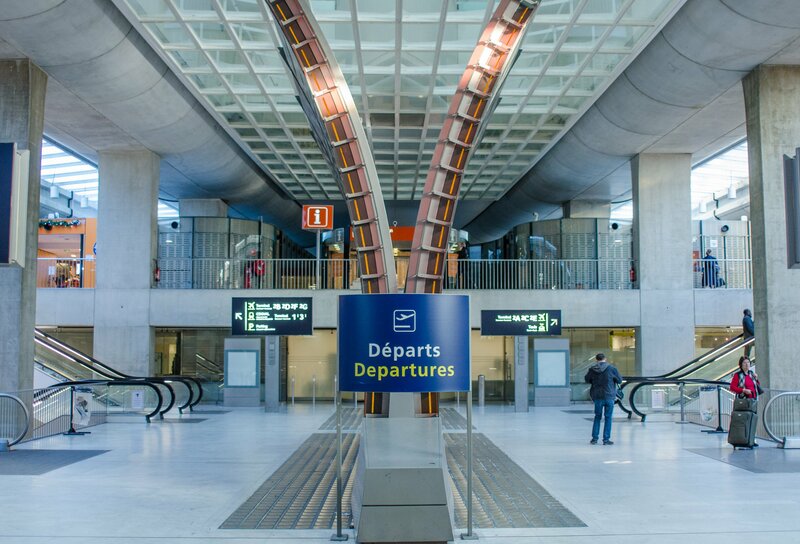 If you’re arriving at Terminal 1, see the CDG Terminal 1 to Paris photo guide. 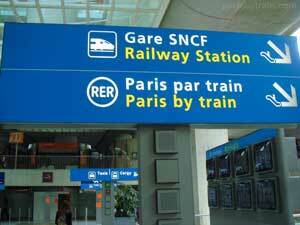 For train times, train ticket prices, maps and other details see the Overview CDG to Paris by Train article. Upon arrival at Roissy-Charles de Gaulle Airport Terminal 2 the first thing that will happen after exiting the plane is immigration/passport control, which can be very quick depending on where you are sitting on the plane. If you’re seated near the front of the plane and are the first to exit, you’ll be the first to go through immigration screening by French national police. You could be past immigration within 5 minutes (or 40 if you’re the last to exit a large plane). Next you’ll collect your baggage at the carousels. Estimate a good 30 minutes for this. Nothing out of the ordinary in terms of expediency, perhaps even a little slow. Customs control for baggage is next, which is separate from passport control and handled by customs officers near the exit of the baggage collection area. In general the customs officers spot check passengers and only stop those who (rarely) rouse their curiosity. After this you’ll exit into an unsecured area of Charles de Gaulle Airport free to make your way to Paris or other cities via train. 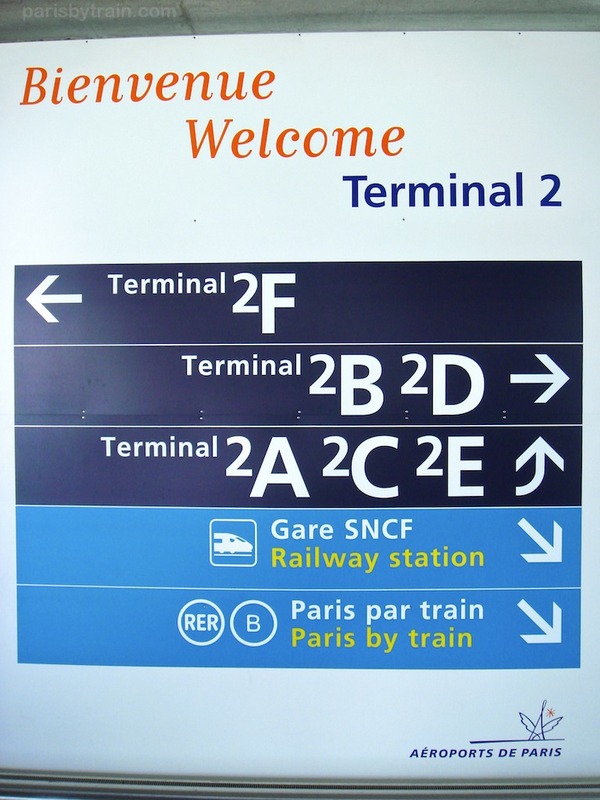 If you happen to be arriving via Terminal 2G, the new Schengen (Euro Borderless Zone) terminal, you’ll need to take a shuttle bus to Terminal 2E/F in order to catch the RER train. The shuttle buses, circulating every 4-5 minutes, can be found just outside the arrivals area of 2G. [Thanks to Lynne P. for this updated information]. 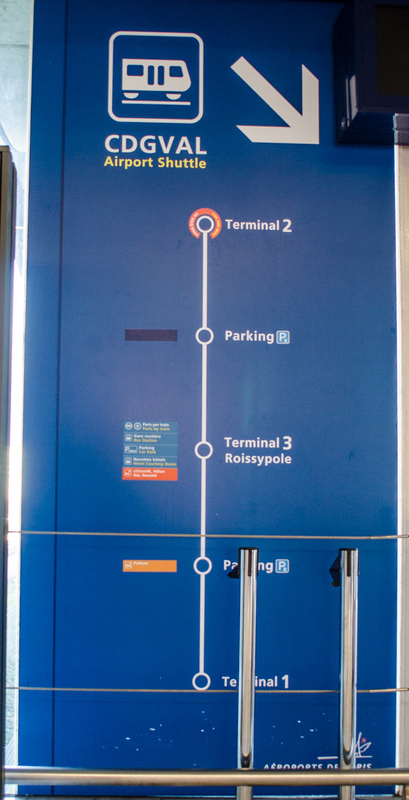 Immediately upon exiting the baggage collection area doors of any CDG Terminal 2 sub-terminal (T2A through T2G), you’ll see the sign below providing directions to CDG Ground Transportation options. I’ve circled in red on the right side Gare SNCF / Railway Station and also Paris par Train / Paris by Train. 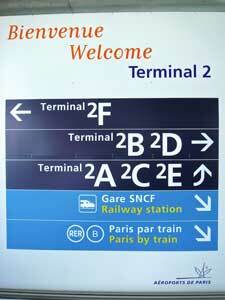 Follow these two signs to get to the trains from CDG Airport Terminal 2 to Paris. 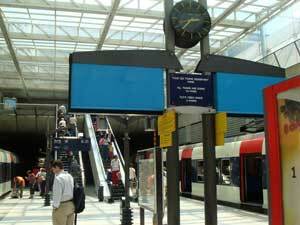 Notice the blue overhead signs? Those will point to Gare SNCF / Railway Station, Paris par Train / Paris by Train. 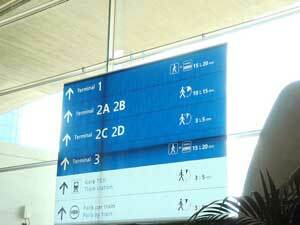 Follow these signs to make your way to the train station located right within Terminal 2. 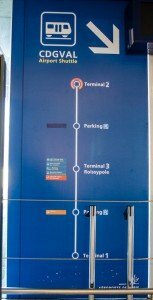 At the end of each of the terminal buildings (there are seven sub-terminals at Terminal 2: terminals 2A, 2B, 2C, 2D, 2E, 2F, 2G) will be a large sign noting how long it will take to reach other terminals and the train station. 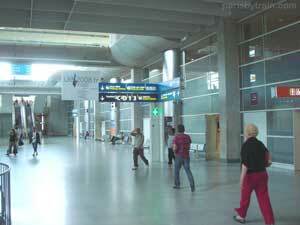 In this photo, we see that the train station at Terminal 2 is 3 to 5 minutes walk from Terminal 2F. 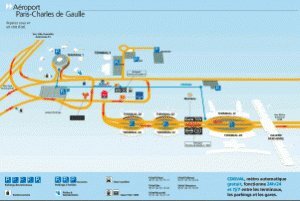 Here is a map of Charles de Gaulle Airport showing the layout of CDG Terminal 2. Also visible are Terminal 3, Terminal 1 (which has its own train station) and CDGVAL shuttle train between CDG’s 3 terminals and parking structures. Closer to the train station area you’ll find more signs directing you down to the station. Train ticket vending machines, green, yellow and blue. 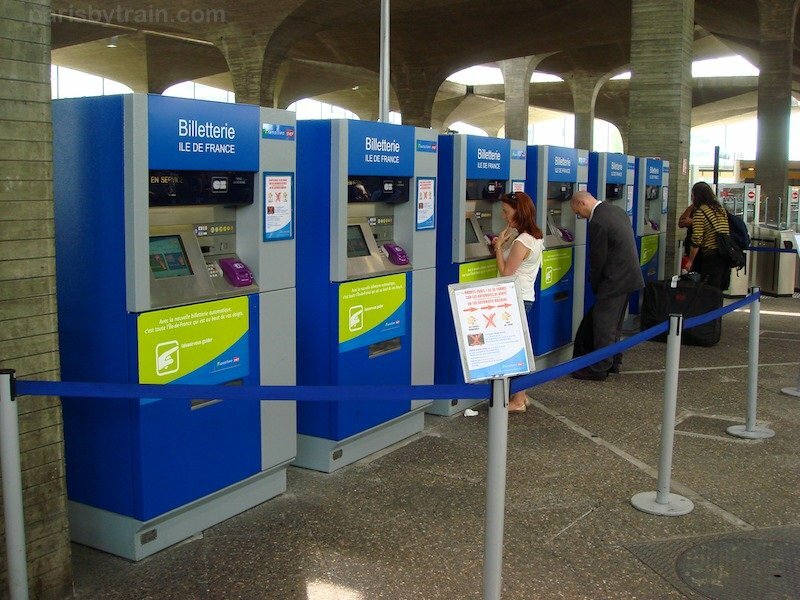 Blue train ticket machines: same as green machines – RER B tickets, Paris Metro, Versailles, Disneyland, etc. 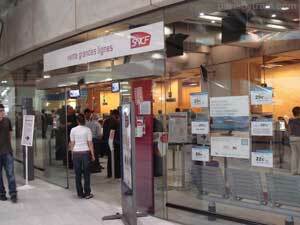 A full service HSBC bank is available at CDG T2 train station (barely visible on right side of below photo). You may wish to withdraw some Euro cash notes from the HSBC bank machine or exchange money from the clerk. If you have non-smart-chip/PIN-protected credit cards, they generally won’t work with the automated ticket machines. Thus you’ll need Euro cash to buy your tickets from the ticket office. The automated train ticket vending machines don’t take Euro cash notes, only coins. There is now a change machine in the CDG Airport train station, accepting 10 & 20 euro notes and producing one/two euro coins. The bill change machine is in the middle of the train ticket machines. 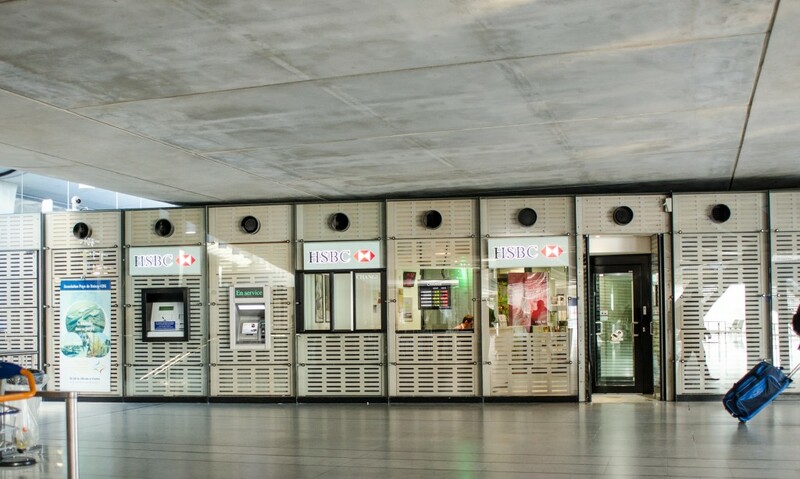 Closer photo of HSBC bank at CDG Terminal 2 train station. 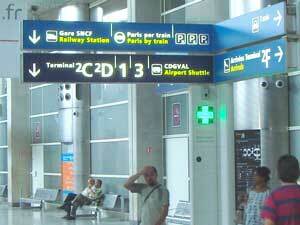 CDG Airport left luggage / bag storage services handled by Baggages du Monde. On level 4 (same level at which you walked here to arrive). Contrary to what some information people are finding on other websites, left luggage services at CDG are open/running/in operation. They are not closed due to security threats. CDG airport train ticket office in Terminal 2 is split into two separate offices on opposite sides of the atrium. Paris Metro / RER tickets and passes for traveling within Paris and the Ile-de-France area (Disneyland Paris, Versailles, etc.) has a sign outside reading Billets Paris et Ile-de-France visible in the photo below. 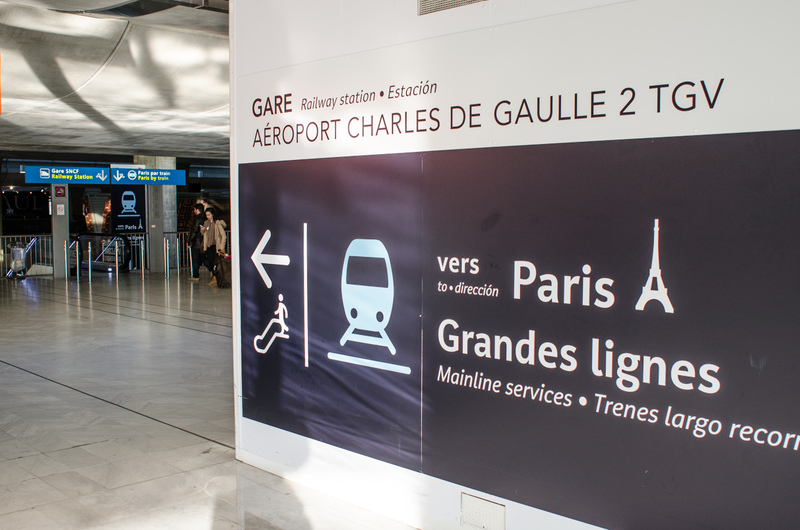 To buy TGV Train tickets at CDG Airport visit the Grandes Lignes train ticket office on the opposite side of the atrium, across from the Paris et Ile-de-France ticket office. The Grandes Lignes ticket office deals exclusively with TGV train tickets and also other brands of intercity trains (Thalys, Eurostar, ICE, etc.). This includes sale, collection, refunds and changes of train tickets going between cities in France and to other European countries. Trains traveling to other cities within France (or other countries such as Belgium, Germany, England), are known as the Grandes Lignes trains. Popular France destinations include trains to Lyon, Avignon, Marseille, Nice, etc. 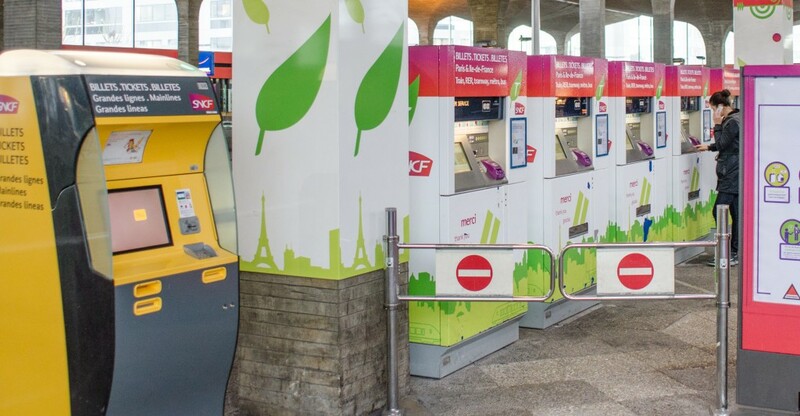 To buy single train tickets to Paris you may use a smart chip credit card or Euro coins (not cash notes) with the white colored Tickets et Navigo vending machines to purchase such tickets. A change machine accepting 10€ and 20€ notes is available on-site to produce 1 and 2 euro coins. Note that you cannot buy the Pass Navigo from these automatic train ticket machines. You must visit the Paris Ile-de-France ticket office to purchase the Navigo Pass due to the plastic physical card. 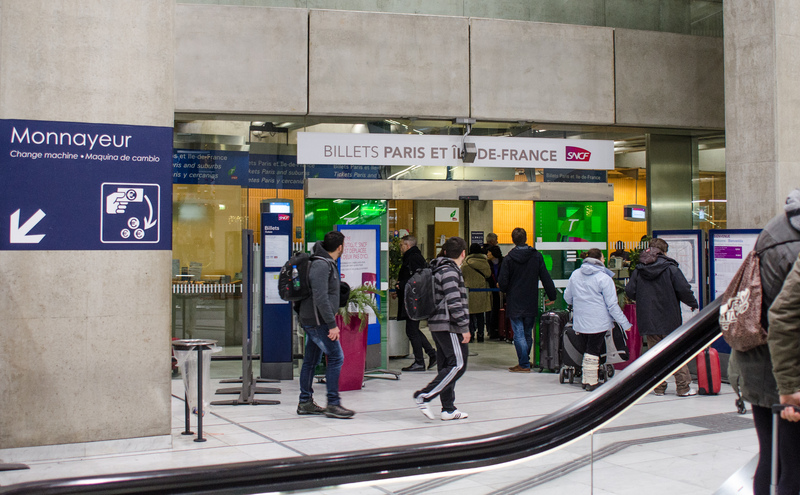 (This ticket office is visible two photos above under banner “Billets Paris et Ile-de-France”.) 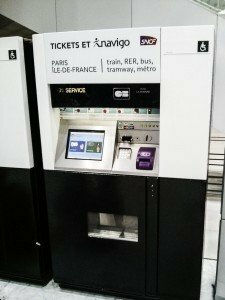 The Paris Visite multi-day train ticket, you can buy from these ticket machines. Bear in mind that these machines will not work with credit cards without chip+PIN, still somewhat common in United States circa 2014/2015. Also, do not use the yellow ticket machines for Paris train tickets. The yellow machines are for TGV, Eurostar, Thalys and other intercity trains. After buying your train tickets or passes it’s time to turn towards the train platforms which will require descending another set of escalators or stairs onto Level 1. 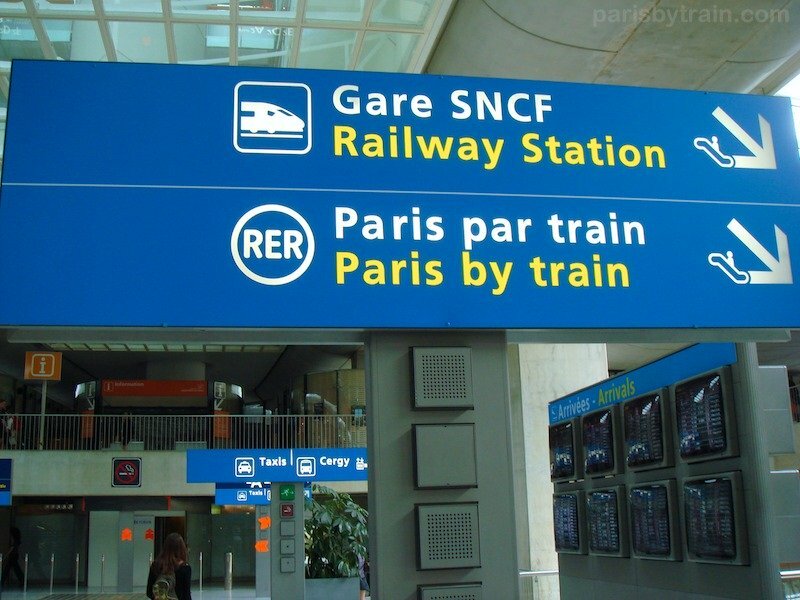 The Paris Train platforms are marked as “Voie” (“platform or lane”) 11 and 12 and also show “RER B Paris par Train“, the Regional Express Network trains that operate between Roissy-Charles de Gaulle Airport (CDG) and Paris city centre. 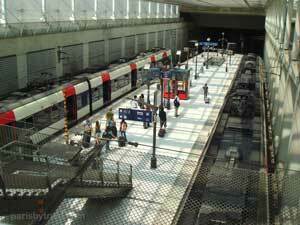 This is a photo overlooking Paris bound train platforms 11 and 12 at CDG Terminal 2 Station. 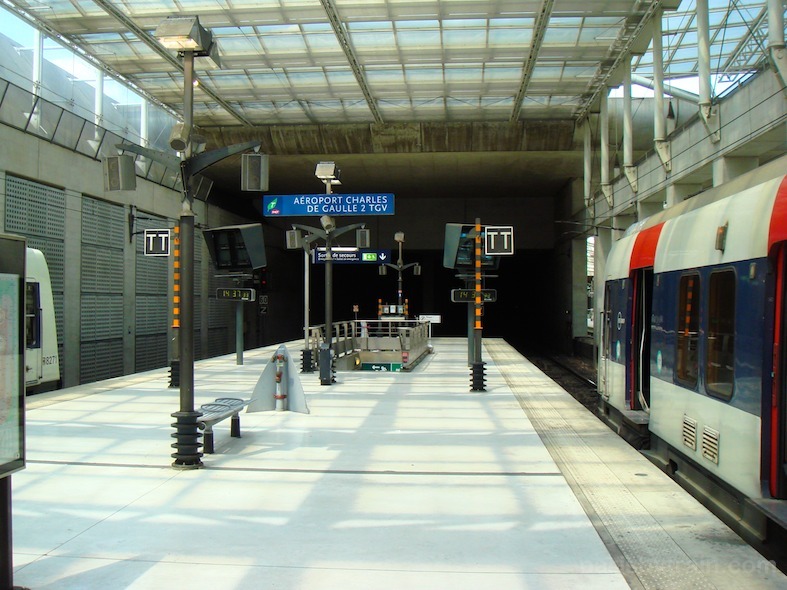 On the platform itself you’ll see signs noting that all trains are going to Paris, since Aeroport Charles de Gaulle is the terminus or end-of-line station for the RER B train line. 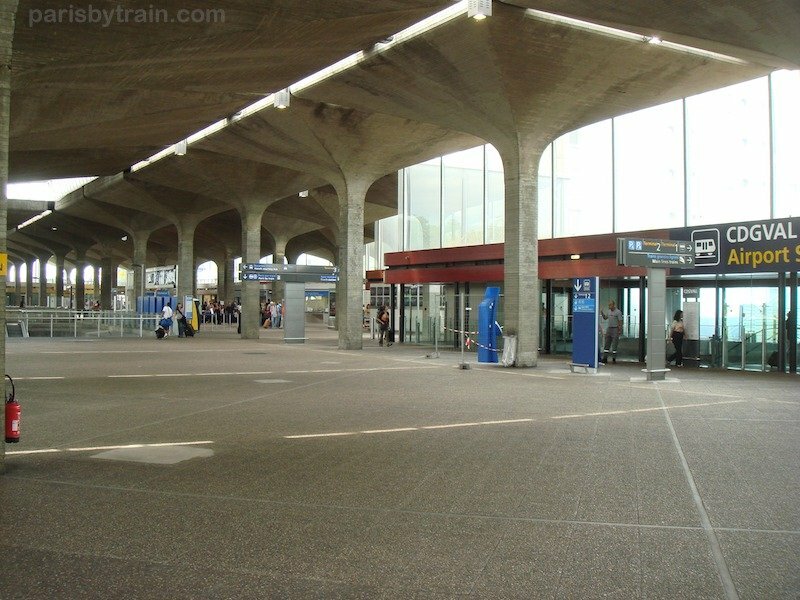 Note that although the platform sign reads Aeroport Charles de Gaulle 2 TGV, this platform shown is not the TGV train platform, it’s simply the name of this station as a whole. 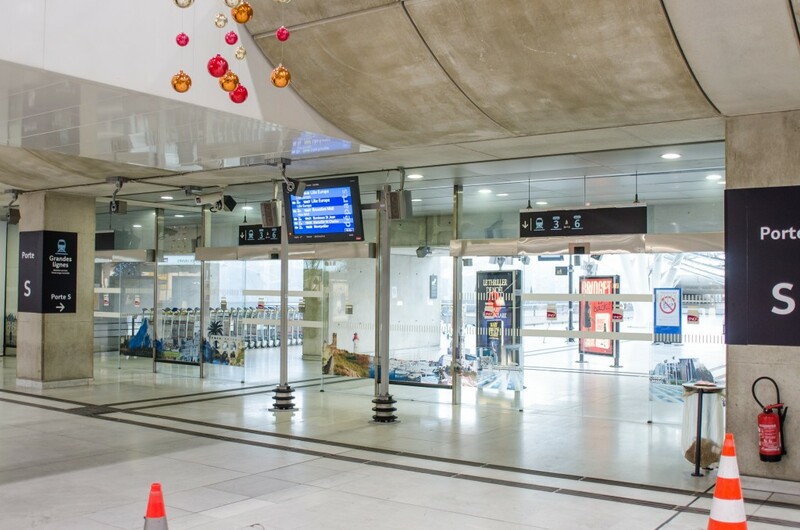 The CDG Airport TGV train platform entrance is located immediately left of the Paris Train platforms through a door marked “Porte S” leading to voie (lanes) 3 to 6. The video screen overhead shows destinations of TGV Trains leaving CDG, train departure time and from which lane (voie). If you’re taking the RER B to Paris, remember to keep your train ticket with you at all times throughout the journey. You may be asked by a ticket controller to show a valid fare or otherwise pay a penalty fare of 35€. 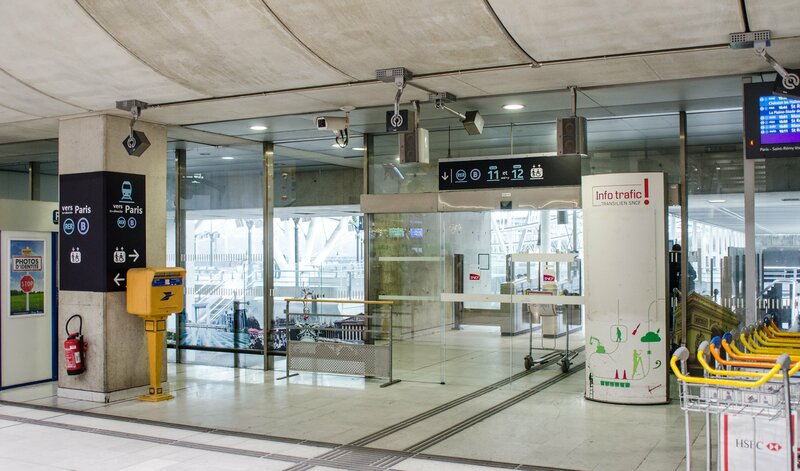 The tickets are also required to exit the arrival station in Paris as there will be turnstiles protecting the exits, just as they protect entrances. you aren’t transferring onto buses or trams – your RER train ticket isn’t valid for them. You must purchase a new Metro/Bus/Tram ticket to transfer onto buses & trams. 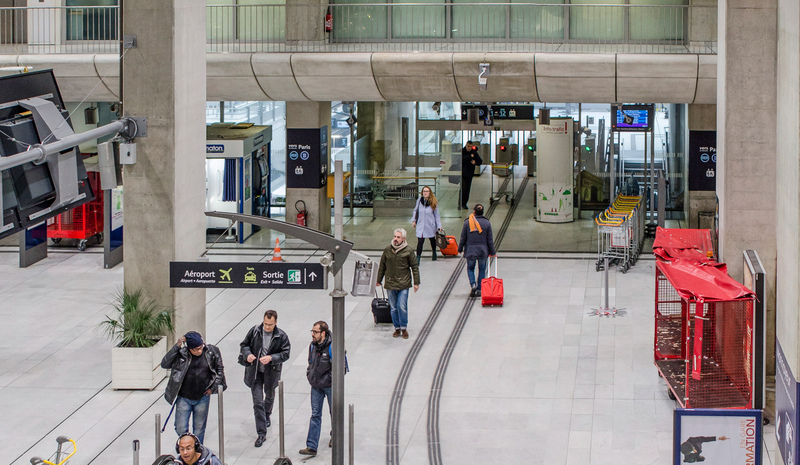 The first Paris city centre station will be Gare du Nord, requiring about 30 minutes for the voyage from Airport CDG Terminal 2. 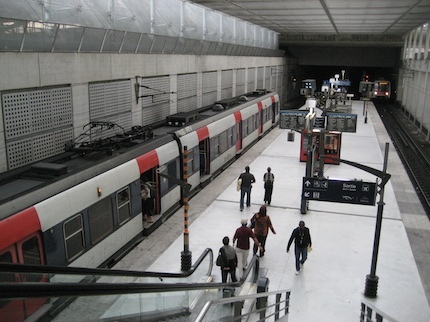 Paris stations along the RER B line after Gare du Nord will be Chatelet Les Halles, St. Michel-Notre Dame, Luxembourg, Port Royal, Denfert Rochereau and Cité Universitaire. The following train timetables show departure times of RER B trains leaving CDG Terminal 2 towards Paris and here are instructions on how to read Paris RER Timetables. 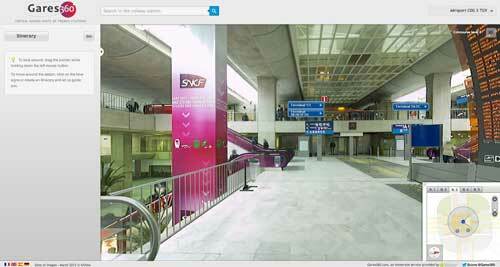 Gares360.com has produced a virtual photo visit of CDG Terminal 2 train station, allowing you to visually see all levels of the train station. Select the level & vantage point you wish to see on the bottom right hand corner of the screen. Finally here’s a video detailing the Facts & Figures about the RER B train line in Paris.